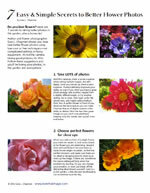 Published Thursday, April 12, 2012, OK personal/derivative use; link www.lovethatimage.com. Tonight I was at the Volunteer Park Conservatory, attending its annual Friends of the Conservatory meeting. The first part was in the Conservatory itself, with perfect late afternoon light showing off many of the exquisite floral displays to perfection. 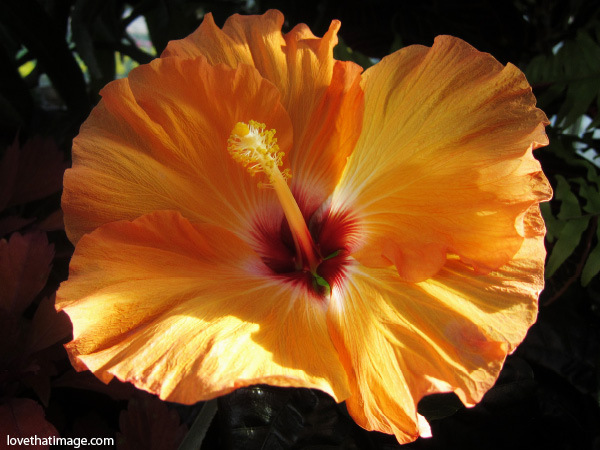 Here is an orange hibiscus flower, all glowing in the light. Please explore Shadow Shot Sunday 2, Mellow Yellow Monday, Today’s Flowers, Weekend Flowers, Floral Friday, Macro Flowers Saturday, Ruby Tuesday 2, Macro Monday, and Macro Flowers Saturday, if you have a minute or two. If you’ve arrived via a link, clicking on the curly letters of Sara’s Fave Photos Blog above will get you the complete photo collection here. Beautiful picture of a Hawaiian flower viewing. That’s a magnificent hibiscus blossom, Sara! I do love hibiscus, and this color is brilliant. Very lovely hibiscus photo — reminds me of summer! What a stunning image! Like Gerberas, the Hibiscus are such cheerful blooms. Thanks for sharing. Happy weekend. That is exquisite, such a delicate flower in perfect light. Magnificent! Wow the lighting in your shot is fantastic. What an exquisite macro! The rich orange color is simple gorgeous. To your question Sara: yes I can notify you if you left me a valid email in linky form. I’m working on a new idea and I’ll notify my old bodies when/if it will come out as I expect. Beautiful flower and excellent composition. The perfect macro. Great yellow hibiscus og “Hawaiian rose” as we call it! That’s one of my very favorite flowers and this color is great! A perfect time for light, and shadows! This is a Macro at it’s finest!!! Cloor, composition, shadows….the whole ball of flower!!! That is an awesome shot. The flower is beautiful and so full of color with soft shadows too. Great Job. Beautiful shot! Love the brilliant orange! Beautiful shot! Have a fabulous week. We have red ones here. Don’t think I’ve ever seen an orange one. The fall of light is like a kiss of romance on this stunning hibiscus! Gorgeous! We are close! I’m in Tacoma. Commenting for MYM. Beautiful shot. I have to post other’s photos as I’m not good at taking my own and mostly write on my site. Am loving seeing all the great photos, though.